it's no secret that i'm always in the mood to bake. when i am happy i love to bake and when i am stressed i find baking to be one of the things that calms me down . . .
nine times out of ten, being in kitchen is therapeutic to me. this is probably because it reminds me of all the happy memories i have from growing up cooking and baking in the kitchen with my mom and my brother. on sunday night i had an itch to bake, and since we had vanilla ice cream at home, i was craving something that would serve as a good base for an ice cream sundae. 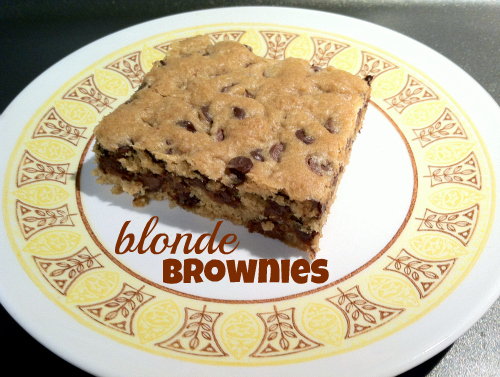 i was in the mood for chocolate chip cookies and ryan was in the mood for brownies, so ryan suggested that we compromise by making blonde brownies. 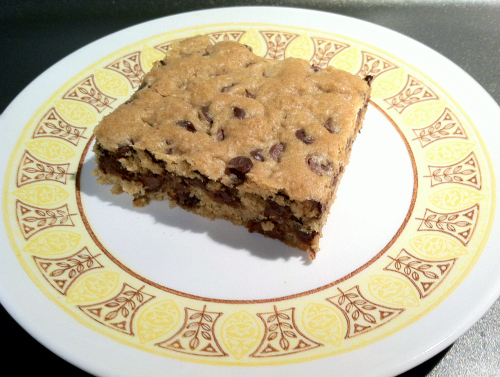 these "blondies" combine the best of both worlds since they taste like a chocolate chip cookie but have the consistency of a brownie. 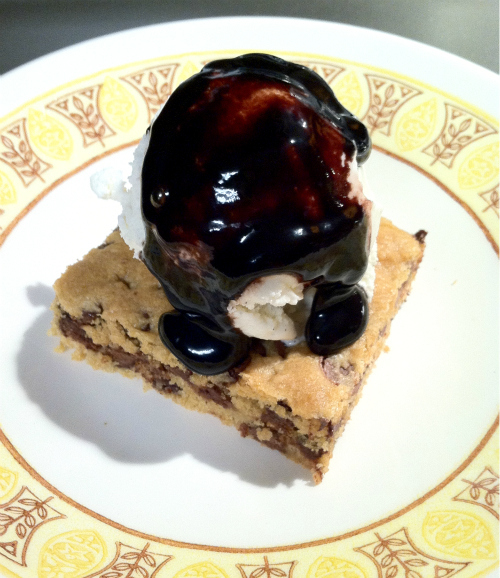 they made the perfect base for our ice cream sundaes too . . . which we ate while curled up in bed with leko watching episodes of the duggars on tivo. what more could you ask for? 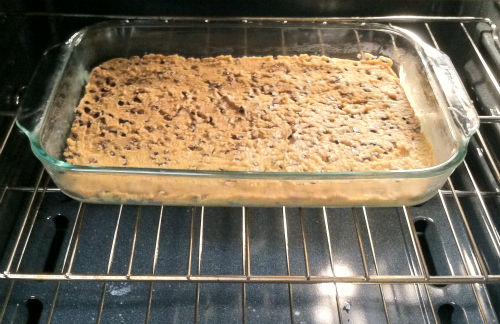 preheat your oven to 350 degrees F. lightly grease a 9 inch by 13 inch baking pan. use an electric mixer to beat the softened butter and both sugars together. add the vanilla and beat in the eggs, one at a time until light and fluffy. sift together the flour and baking powder. add half of the flour to the batter with the mixer on low speed. once the flour has been incorporated, add the second half. 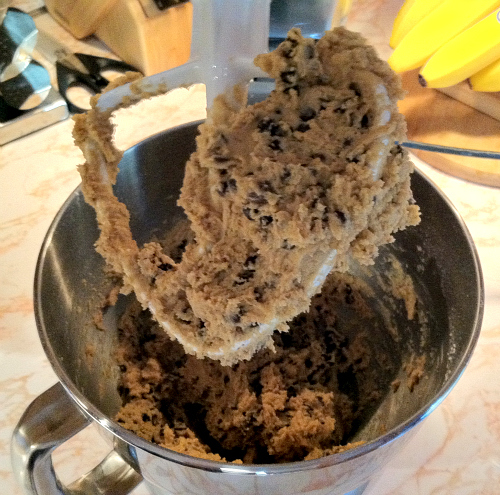 (the batter will be stiff like cookie dough.) stir in the chocolate chips (and optional walnuts). spread the batter in the pan. bake for 30 minutes or until a knife inserted into the center comes out clean. 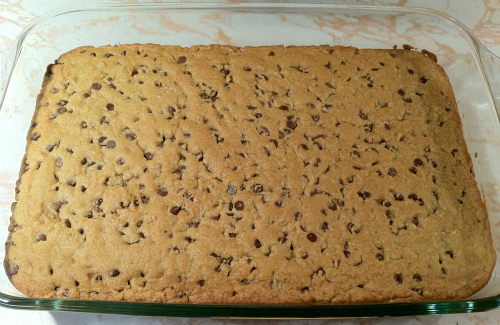 let cool, and then cut into squares.